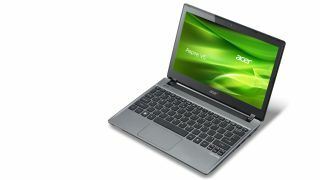 It's all about the touchy-feely for Acer at IFA 2012, with its M3 and V5 ultrabook ranges getting a touchscreen update. The Acer Aspire M3 Touch now comes with a 15.6-inch 10-point touchscreen ready to play nice with Windows 8. At 22mm thin, it's still an ultraportable notebook weighing in at 2.3kg and rocking Intel Core innards and an Nvidia GeForce GT640M GPU. Also getting the touch-treatment is the Acer Aspire V5 series, which now also has a larger trackpad for greater gesture control. Available in 14-inch and 15.6-inch variants, the V5 touchscreens are also 10-point affairs ready to take Windows 8 on. No word on availability or pricing for either of the upgraded ranges, but we imagine keeping an eye out around the end of October would be a sensible move.